Are First-Time Buyers Being Shut Out? Across the country, first-time home buyers have been putting in offers on homes, but many of them keep losing out. One working mother says she’s put in 30 offers on homes in the $100,000 range in the Atlanta area, bidding $2,500 to $3,000 above the asking price, but each time she’s been outbid. “We have to be on top of the game and be able to drop everything and check out a house or it will be gone,” says another couple in Alexandria, Va. Tight housing inventories are playing a role. For example, in Boston home listings are down 57 percent and in Atlanta area home listings have dropped nearly 40 percent in the past year. And then you get the real estate. Welcome to Tony Montana’s American dream — an almost 10,000 square foot“Roman Revival” mansion surrounded by palm trees and mediterranean gardens. The exterior of the home stood in for the “Scarface” gangster’s mansion in Miami, Fla., but is actually located in Santa Barbara, Calif. The 10-acre property boasts two fountains (indoor and outdoor), a swimming pool, tiled murals, a guest house and amazing views of the Pacific ocean. It also has four bedrooms, two full bathrooms and two partial bathrooms, according to the listing details. The home hit the rental market at $30,000 a month, according to real estate blog Trulia. While it may seem like a jaw-dropping price, Trulia notes that the home’s monthly rent had once been listed for a jaw-dropping $150,000, or $35,000,000 to just buy the whole thing. Compared to those prices, this deal is a steal. 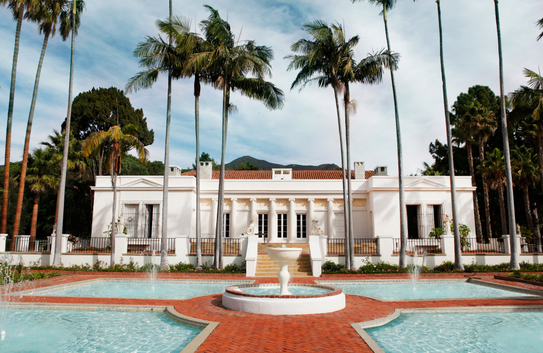 Known as “El Fureidis” locally, the estate was designed by American architect Bertram Grosvenor Goodhue and finished in 1906, reports Curbed LA. It unfortunately does not contain a sunken bathtub in the master suite, nor a living room mini-pool perfect for a dramatic death, but a gangster can still get comfortable here. All they have to do is make the money first. 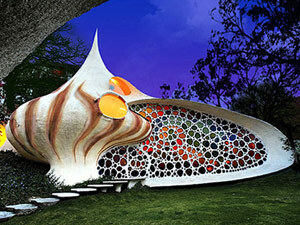 Background: This seashell-shaped home was completed in 2006. The stone steps running along the shrubs lead to the front door, which blends into the mosaic façade. Why It’s Unique: Architect Javier Sensonian practices what he calls “bio-architecture,” a style that has led him to design buildings shaped like snakes, whales and several other creatures. The Nautilus was created to imitate a crustacean’s shell, and its cavernous interior is filled with vegetation and small trees. “It’s not common that you would see a home of this design ascetic,” Koliopoulos says. “However, it’s very enlightening and something that we can all learn from. A house is not a HOME until you make it yours! Ready to create your masterpiece today? Call Laura Key at 310.866.8422 for a free homebuying consultation! As the overall housing recovery gains steam, local market divergences are growing wider. That is because one overriding factor —faulty and fraudulent mortgage lending — brought the market down; it will take varied local and national market drivers — jobs, income growth, consumer confidence, increased lending — to bring it back. And that is why certain markets remain buyers’ markets and certain ones have fast become sellers’ markets. Online real estate marketplace Zillow, defines a sellers’ market as not necessarily one where prices are rising, but one in which homes sell faster, price cuts occur less frequently and final sale prices are close to or greater than list price. Zillow ranked the top 30 markets and found that the formerly hard hit markets in California, Arizona and Nevada now rank as the top sellers’ markets, which may seem counterintuitive, until you consider who the buyers there are now. The best buyers’ markets are equally surprising, with Chicago, Cleveland and Philadelphia topping the list. These markets are still plagued by distress, despite the fact that their foreclosure numbers were lower during the worst of the housing crash. Investors are a far smaller share of buyers, as these markets don’t offer the sun and leisure opportunities that the sand states do. Home prices are still suffering in these markets under still-tough local employment conditions. All that makes them less desirable for buyers. Stricter mortgage lending standards are also likely playing an outsized role, since most buyers in these markets would be owner-occupants. The housing crash was the first fully national housing downturn in U.S. history. Usually housing downturns are local, spurred by some local phenomenon. Now that the overall economy is on the upswing, housing return to its roots and rises and falls on local factors again. Not realizing that if you don’t write a strong offer to purchase, the seller may reject or not respond to your offer. Not realizing that if you don’t write a strong offer to purchase, you may lose the property to another more highly motivated buyer. Not realizing that, without a confidentiality agreement, a seller need not treat your offer as confidential. Not understanding when a contract becomes legally binding. Entering into an agreemetn before checking title records, liens, and other thigns to ascertain whether the seller will be able to close escrow as scheduled. Not understanding the legal implications of loan and inspection contingencies, and other contractual provisions. Not obtaining a seller’s disclosure. Not conducting your own inspections and investigations as the buyer. Not fully considering the legal, tax, credit and other ramifications of homeownership, especially co-ownership. Not properly handling a claim for property defects discovered after close of escrow. Now that the housing market is back, home improvements are, too. And they’re paying off better than in years past. 2013 is shaping up pretty sweetly for home owners. First, there were the home owner-centric tax benefits (energy tax credits, PMI deduction,mortgage debt forgiveness) that Congress and the President extended through 2013; and now, we’re seeing that our home improvement dollars are working harder. After several bruising years, spending on remodeling projects is up and so too is your return on your remodeling dollars. The national average percentage recoup on all 35 projects in Remodeling Magazine’s 2013 Cost vs. Value Report rose since last year. What a different story from 2012, when the ROI dropped in all but three categories. The annual report is based on a survey that asks REALTORS® around the country to estimate what specific projects, from adding an attic bedroom to installing new windows, would recoup in their market at resale under current conditions. Of course, what you recoup depends on the specifics of your project, your market, and when you sell. But the report offers a great bird’s-eye view of project costs and returns. So which projects offer the best value for the money? Exterior projects like siding, window, and garage door replacements took seven of the top 10 spots in this year’s list. Makes sense since REALTORS® always say curb appeal is half the battle when you’re trying to sell. Although it’s not in the top 10, I was gratified to see that the backup generator project is up about 5 percentage points since 2012. One of our bloggers, Lisa Kaplan Gordon, invested in a portable generator last year after one too many storms and power outages, and despite the learning curve, she was glad she did. She had power when a lot of her neighbors didn’t; she even shared power. Indoors, the top-10 projects include a minor kitchen remodel (involving cabinet refacingand new countertops and appliances), which recouped 75.4% nationally. Kitchen redo aside, replacement projects, such as installing an entry door or new siding,tend to have a higher cost-to-value ratio than remodeling projects. But now that housing has turned a corner, home owners are stepping up their remodeling plans. Harvard’s Joint Center for Housing Studies saw 9% growth in remodeling in 2012 and predicts that trend will continue as more and more distressed properties are bought and rehabbed. The housing group says interest in energy-efficiency updates will keep on trucking, too. It’s the one area where spending on remodeling projects rose during the recession. I’m betting the revived energy tax credit will add fuel to that trend. Neighbors wage war every day over blocked views, loud noise, big and small annoyances. Do you have a good neighbor policy? How’s it working out? File this under No Good Deed Goes Unpunished: A Buffalo home owner sued her neighbors for cleaning up her littered patio without her permission. She said they trespassed and discriminated against her. A federal judge disagreed, and forced her to pay $107,000 in attorney fees. Think I’ll skip that neighborhood’s next block party. I’ve been a home owner for 27 years and can think of no greater hell than waging war with neighbors. The idea of scurrying to collect my mail so I’ll avoid an angry couple next door makes me want to down a Xanax. So what do I do? I usually bend over backwards to keep the peace. Once, I hacked off the tops of my sunflowers because my neighbor complained they blocked the sun from shining on her tomatoes. For the past two summers, I’ve allowed a twangy lute to drown out summer crickets because another neighbor adds a mid-eastern soundtrack to his nightly pool parties. And I let it go when the couple across the street snuck into my yard and pruned my willow because they thought it blocked traffic sight lines around the corner. But I may be in the minority. These days, it seems like neighbor feuds are the rule, not the exception. Former Seattle Mariners first basemen John Olerud finally won a long, unhappy battle with the minister next door to remove a Chinese pine that obstructed Olerud’s lake and mountain views. The neighbors had been great friends, and it seems a crying shame they let a pine tree rip them apart. Sick of escalating fights over loud reggae music, a Tampa judge sentenced two feuding neighbors to monthly potluck dinners together. Maybe breaking bread will stop the fights: If it were me, I’d bring a taste tester before I bit into the tuna casserole. Neighbors complained when a “starving artist” in East Hampton, N.Y., invited any and all tothrow a pint of paint on his house. The artist wanted a free paint job: What he got was angry neighbors worried about property values. Can’t we all just get along, or at least get some perspective? I’m not saying hack off sunflowers to avoid a fight — that just worked for me, and my flower-loving neighbor felt guilty for years. But some honest communication, or perhaps a little mediation, could keep your front yard from becoming a battleground. Have you ever confronted a neighbor? How’d it turn out?